The year is 1519 and the place is Coventry, England. Seven people have just been sentenced by the Catholic church to be “purified by the Church” – which means they are to be tied to stakes and burned alive. Their crime? They were found guilty of reading the Lord’s Prayer and the Ten Commandments to their children in English instead of Latin. Ten years later, in 1536, at the age of 42, William Tyndale was strangled and burned at the stake. His final words, spoken "at the stake with a fervent zeal, and a loud voice", were reported as "Lord! Open the King of England&apos;s eyes." His eyes were opened, and King Henry VIII authorized the Great Bible 3 years later, which was the first authorized edition of the Bible in English and was largely based on Tyndale’s version (which sadly was incomplete at his death). The Geneva Bible followed in 1557 during the reign of the Catholic Bloody Mary, and it was the first English bible made available directly to the general public. The King James version was published in 1611. What had William Tyndale accomplished in his 42 years? He had single-handedly translated most of the Bible into English, and his translation was so accurate and so beautiful that when the King James English Bible appeared less than 100 years later in 1611, the New Testament was 83% the same as Tyndale’s translation, and the Old Testament was 76% the same. If you wonder whether beauty in translation really matters, and there is certainly a subjective component to it, consider some translations of 2 Samuel 18:33. Think about the word choice, word arrangement, sound, cadence, and sentence structure. They each get the point across, but that last one I think many would agree towers above the others in capturing the beauty, the gravity, and the tragedy of the passage. But we often hear today that the KJV is so complicated and so hard to read! Really? Note that in the KJV translation of that verse every word is monosyllabic except for “chamber” and “Absalom.” Remember that Tyndale was translating for that plowboy! At times Tyndale needed a word in English that did not then exist, so he created it. English words coined by William Tyndale include Jehovah, birthright, fleshpots, Passover, scape-goat, stiff-necked, and longsuffering. Each of those translated phrases came from Tyndale’s English version of the Bible, for which he was burned at the stake. Take yourself back to England in the 1500’s, and imagine that you are that plowboy that Tyndale spoke about. You have never heard the word of God read in a language that you understand. But suddenly you do. Imagine hearing these words for the first time. God’s word is no longer being hoarded, and God is no longer being kept at a distance. And he sounds like you sound. He uses your words, your patterns and rhythms. There is no longer a wall, or a divide, by way of speech. What is my point in recounting this history of the English Bible? My point is that I fear we are sometimes guilty of taking for granted one of our greatest blessings – ready access to the word of God in our own language. Many people throughout history have lived and died without ever enjoying that blessing, and many have died so that we can enjoy it today. If you could go back in time and hand your Bible to someone in England in the 1500’s – do you think that Bible would sit on the shelf unopened collecting dust? Do you think that person would find other things to do rather than spend time in God’s word? The next time you open the Bible, pretend it is the first time you have ever read it. Read it through the eyes of one who had been denied that privilege up until this very day, who had never heard the Bible in a language he could understand, but who had seen the Bible only as a book chained to a pulpit. In the 1500’s that was a very common occurrence. Why did the Catholics not want the Bible translated into English? There can be only one reason for that – it was a threat to their own authority. They did not want the people to be able to use the word of God as an authority, and particularly in view of the Catholics’ great departures from the Bible. Once the Bible was in the language of the people, the Reformation followed quickly, as did the Restoration later. Absent the Bible in English, that Restoration would never have occurred because we would have had no pattern to restore. Let’s shift gears a bit, travel back from the 1500’s to our own modern day, and let me ask another question – why are we so divided in this country? Has there ever been a time since the Civil War when we were more divided? And unlike the Civil War, the division is not geographical – neighbors and families are divided. Why? What is the cause? The Bible has been under attack in this country for years, and we are today seeing the outcome of that attack. We have sown the wind, and we are reaping the whirlwind. Although the attacks have certainly intensified in recent years, attacks against God’s word are not new. Satan has attacked the word of God from the very beginning, and he continues the attack today. Genesis 3:3-4 -- But of the fruit of the tree which is in the midst of the garden, God hath said, Ye shall not eat of it, neither shall ye touch it, lest ye die. 4 And the serpent said unto the woman, Ye shall not surely die. God said one thing -- and Satan told Eve that God really meant exactly the opposite. That subversion of God&apos;s word by Satan continues today and is proclaimed each week from liberal denominational pulpits by preachers who tell the openly rebellious, "Ye shall not surely die." Men have also long attacked the word of God. In Jeremiah 36, King Jehoiakim took a knife to the word of God, cuts it into pieces, and threw the pieces in the fire. Docletian, a Roman emperor, burned so many manuscripts of the Bible that he erected a column that he called Extincto Nomine Christianorum or "The name of Christians has been extinguished." Famous infidels thought they could do away with the Bible permanently. Voltaire, the French writer and atheist, said "Fifty years from now the world will hear no more of the Bible." But 50 years after his death, the Geneva Bible Society was printing Bibles in his former house! Thomas Paine, who wrote The Age of Reason 200 years ago, once boasted, "When I get through there will not be five Bibles left in America." Robert Ingersoll once said, "I am going to put the Bible out of business." In 1879 he published a book entitled "Some Mistakes of Moses." One reviewer said a more accurate title would have been "Some Mistakes of Ingersoll"! Political correctness today wants to do away with the Bible. The so-called "hate crime" legislation being pushed today will be used tomorrow to persecute those who would dare read in public what the Bible has to say about homosexuality. If you think that is unlikely, it has already happened in Sweden. They had a hate speech law that was originally intended to protect the Jews from Nazi sympathizers, but which was recently amended to include sexual orientation. In 2004, a Swedish Pentecostal preacher was sentenced to a month in jail for preaching a sermon and publishing an article that summarized what the Bible has to say on the subject of homosexuality. A local gay activist was quoted as saying that the sentence should have been much longer. If you think that we will never face that type of hostility and persecution in this country, then all I can say is that I hope you&apos;re right -- but I think you are not. I think it is already happening. Today the Bible is being attacked as much by its supposed proponents as by its opponents. Theistic evolutionists, for example, tell us that while we can trust the Bible when it comes to theology, it is not to be trusted when it talks about our origins. The Bible has suffered much abuse at the hands of liberal theologians. And their attacks have not been without effect. In 1963, 2 of 3 Americans viewed the Bible as the word of God. That number had fallen to 1 of 3 in 1999. I hate to think what the number is today. How should we respond to these attacks? We can respond defensively or offensively. Sometimes a defensive posture is best -- and defending the word of God from the attacks of man is not difficult. We are told that the Bible we have today is so different from the original manuscripts that we can never be sure of what God really said. Wrong! The scribes who copied the scripture worked with extreme care -- checking and rechecking their work. In the opinion of scholars, the Bible text that we have today is practically identical to the original. The text of the Bible has been established with greater certainty than any other ancient text. This argument that we cannot know whether we have accurate copies of the original autograph copies of Scripture has been called a "theological scarecrow to frighten those who are not knowledgeable of the art of transmission of the Bible." There are some minor variations among the manuscripts such as a different letter here and there or a different word ordering, but those differences amount to less than one word in a thousand, they are easy to spot, and they do not change the meaning of the text. If there was any doubt that we have accurate copies of the original manuscripts, that doubt should have been permanently removed in 1947. Beginning in 1947 in a region just west of the Dead Sea some 500 documents known today as the Dead Sea Scrolls were found. About 100 of the scrolls are Old Testament books in Hebrew representing at least portions of every Old Testament book except Esther. The manuscripts date from the last few centuries BC to the early part of the first century. In 1948, it was called "the most important discovery ever made in Old Testament manuscripts" and that designation remains true today. It has also been called the great archaeological discovery of all time. Even though the two copies of Isaiah discovered in 1947 were a thousand years earlier than the oldest dated manuscript previously known (AD 980), they proved to be word for word identical with our standard Hebrew Bible in more than 95% of the text. The 5% variation consisted chiefly of obvious slips of the pen and variations in spelling. To give a specific example, of the 166 words in Isaiah 53, there are only 17 letters in question. Ten of those letters are simply a matter of spelling. Four letters are minor stylistic changes, such as conjunctions. The remaining 3 letters comprise the word "light," which is added in verse 11, and that addition does not change the substance of the verse. Thus, after 1000 years of transmission, there is only one word in question in that entire chapter, and that word has no effect on the meaning of the verses. We are told that the Bible is full of scientific and historical errors, and so -- while we may be able to trust it on theological matters -- it is not to be trusted on these other matters. Wrong! There are no errors in the Bible, but that is not to say there are not difficulties. R.A. Torrey: "It is clear that there must be difficulties for us in a revelation such as the Bible. If someone were to hand me a book that was as simple to me as the multiplication table, and say, &apos;This is the Word of God. In it He has revealed His whole will and wisdom,&apos; I would shake my head and say, &apos;I cannot believe it; that is too easy to be a perfect revelation of infinite wisdom.&apos; There must be, in any complete revelation of God&apos;s mind and will and character and being, things hard for the beginner to understand; and the wisest and best of us are but beginners." Augustine: "If we are perplexed by any apparent contradiction in Scripture, it is not allowed to say the author of this book is mistaken; but either the manuscript is faulty, or the translation is wrong, or you have not understood." Even though we may often find ourselves on the defensive, we must not neglect our other option -- go on the offense! First we should point out the bias of the attackers. "While insisting on their right to treat the Bible &apos;like any other book,&apos; some critics proceed to treat it like no other book, by bathing it in the acid solution of their skepticism and historical pessimism." Second, we should remind the critics of their own frequent errors. They have been proved wrong again and again in their attempts to discredit the Bible. They once argued that Sargon never existed despite Isaiah&apos;s claim in 20:1 that he was King of Assyria. In 1843, Sargon&apos;s palace was discovered. They once argued that Moses could not have written the Pentateuch because writing was not developed until long after his death. A discovery in 1949 established that the Hebrew alphabet dates back at least 3500 years. They once argued that the Hittites never existed even though they are mentioned over forty times in the Bible. The Hittite capital was discovered in 1906. They once argued that the Horites never existed even though they are mentioned twice in the book of Genesis. Evidence of the Horites was found in 1925. In 1993 the first inscription ever found was discovered bearing the phrase "House of David" and "King of Israel". Critics had claimed that David had never existed—and now an inscription had been found that showed that the critics were wrong. In 1895, the Dean of Canterbury, Dr. F.W. Farrar—a highly respected scholar—wrote The Book of Daniel as part of The Expositors Bible. In this work he stated: "there is no Belshazzar". Such a character never existed, claimed Farrar along with other critics of the time. This was said while a clay cylinder found in 1854 awaited decipherment. When it was finally deciphered, the name of "Belshazzar" was clear and unmistakable, and yet another liberal attack bit the dust. Since then several other references have been found to Belshazzar. Don&apos;t bet against the Bible! You will lose every time! Third, we should remember that the Bible is powerful. The Bible is not described as our shield, but rather as our sword. Hebrews 4:12 -- For the word of God is quick, and powerful, and sharper than any twoedged sword, piercing even to the dividing asunder of soul and spirit, and of the joints and marrow, and is a discerner of the thoughts and intents of the heart. Isaiah 55:11 -- So shall my word be that goeth forth out of my mouth: it shall not return unto me void, but it shall accomplish that which I please, and it shall prosper in the thing whereto I sent it. Ephesians 6:17 -- And take the helmet of salvation, and the sword of the Spirit, which is the word of God. Fourth, the Bible is unique among the religious books of the world – and we should never hesitate to make that known. Dr. Montiero Williams, professor of Sanskrit for 40 years, said the following: "Pile them, if you will, on the left side of your study table, but place your own Holy Bible on the right side, all by itself and with a wide gap between them, for there is a gulf between it and the so-called sacred books of the East that severs the one from the other utterly, hopelessly, and forever." The Hindu writings tell us that the moon is 50,000 leagues higher than the sun and shines by its own light, that the world is flat and composed of seven stages (including one of butter and one of sugar), and that the entire earth is born along on the backs of elephants. Ancient Indian creation accounts tell us that the earth is carried about on the back of a giant turtle. If you pick up a book on alleged Bible contradictions you will never read anything even remotely approaching the following: "The Bible says in Genesis that the earth rests on the back of a turtle. How can that be explained?" Instead, you find minute picayune details that someone somewhere has decided is wrong and has then tossed back on us to explain. When I read those books -- and I see the grasping at straws that goes on among the infidels -- my faith in the Bible as the inerrant word of God increases beyond measure! Is that the best they can come up with in their attack against a book that is thousands of years old, written by multiple authors over a large span of time? How does the Bible compare with the Koran? In short, the Koran is a confused and confusing mess. Muhammad rambles along throughout combining and misstating numerous events from the Old Testament and other sources. The Koran repeats the story of the Exodus 27 times in the first 89 chapters -- and yet never mentions the Passover, presumably so as to avoid the clear connection with Christ. He refers to Noah in 28 of the first 71 chapters. If the repeated portions of the Koran were removed, it would be only 40% of its current size. And he very often gets the details wrong -- in one account of the exodus, Pharaoh asks Haman (a Persian from the book of Esther) to build the tower of Babel. The unity of the Bible is undeniable. 40 or more people wrote down the inspired text over a period of about 1600 years. They wrote in different languages (Hebrew, Aramaic, and Greek) and from different locations across two continents. With this being true, one might expect that so diverse a group writing about so many different topics over such a long period of time would have produced a tangled mishmash of books full of internal inconsistencies and errors -- but what you find is just the opposite. They wove over those 1600 years a perfect, never contradictory theme. The Bible harmonizes perfectly from the first book to the last. Also, you cannot pick up a religious publication today in which it does not in some way criticize (and often rightly so!) the writings from some other religious publication. You never see that in the Bible. No Bible book ever criticizes another Bible book. Instead, they all with one voice tell us that what they contain are the very words of God. The Bible says that it is the inspired word of God. The Bible records the thoughts of God rather than the thoughts of men. 2 Peter 1:21 -- For the prophecy came not in old time by the will of man: but holy men of God spake as they were moved by the Holy Ghost. 1 Peter 1:10-12 -- Of which salvation the prophets have inquired and searched diligently, who prophesied of the grace that should come unto you: 11 Searching what, or what manner of time the Spirit of Christ which was in them did signify, when it testified beforehand the sufferings of Christ, and the glory that should follow. 12 Unto whom it was revealed, that not unto themselves, but unto us they did minister the things, which are now reported unto you by them that have preached the gospel unto you with the Holy Ghost sent down from heaven; which things the angels desire to look into. That last passage is particularly instructive. The Old Testament prophets sometimes did not even themselves understand what they were saying would come to pass. The Bible is the word of God rather than the word of man. 2 Samuel 23:1-2 -- Now these be the last words of David. David the son of Jesse said, and the man who was raised up on high, the anointed of the God of Jacob, and the sweet psalmist of Israel, said, 2 The Spirit of the LORD spake by me, and his word was in my tongue. Jeremiah 1:9 -- Then the LORD put forth his hand, and touched my mouth. And the LORD said unto me, Behold, I have put my words in thy mouth. Acts 1:16 -- Men and brethren, this scripture must needs have been fulfilled, which the Holy Ghost by the mouth of David spake before concerning Judas, which was guide to them that took Jesus. 1 Corinthians 2:12-13 -- Now we have received, not the spirit of the world, but the spirit which is of God; that we might know the things that are freely given to us of God. 13 Which things also we speak, not in the words which man’s wisdom teacheth, but which the Holy Ghost teacheth; comparing spiritual things with spiritual. John 17:8 -- For I have given unto them the words which thou gavest me; and they have received them, and have known surely that I came out from thee, and they have believed that thou didst send me. Matthew 10:20 -- For it is not ye that speak, but the Spirit of your Father which speaketh in you. The writer of Hebrews quotes Psalm 95:7 twice (3:7 and 4:7). The first time he attributes the words to the Holy Spirit, and the second time he attributes them to David. The word "inspired" is used only once in the New Testament (2 Timothy 3:16), where it literally means "God breathed." What does it mean? Let&apos;s begin with what inspiration does NOT mean. Inspiration is not a high level of human achievement. We sometimes say that the works of Shakespeare or of some other great artist are inspired, or that an artist was inspired to create some work of art -- but that is not how the Bible is inspired. It is not a work of man. Inspiration is not only in thoughts provided by God to the writers. Some argue, for example, that God conveyed to Paul some thoughts about how great love is and then Paul filled in the details by writing 1 Corinthians 13. But again, that is not how the Bible was inspired. Phrases such as "thus saith the Lord" and "the word of God" appear over 3800 times in the Old Testament alone. If men took the thoughts of God and came up with the words themselves, then why the warning in Deuteronomy 4:2? Deuteronomy 4:2 -- Ye shall not add unto the word which I command you, neither shall ye diminish ought from it, that ye may keep the commandments of the LORD your God which I command you. If men took the thoughts of God and came up with the words themselves, then how do we explain 1 Peter 1:10-11, which says that Old Testament writers sometimes did not understand the words that they wrote? If God supplied the thoughts but men suppled the words, then how can we explain the arguments in the New Testament that depend on the tense of a verb (Matthew 22:23-33) or the singular form of a word (Galatians 3:16). God revealed his thoughts in words -- and that is why we say that the inspiration of the Bible is verbal inspiration. Inspiration is not the act of God upon the reader. Some, particularly today, argue that inspiration is goose-bump inspiration or existential inspiration. That is, men are free to determine the meaning of scripture for themselves, whatever they determine it means for them becomes the truth for them (but perhaps not for others), and that act of interpretation is an act of God&apos;s inspiration on that person. We will have an entire lesson on this concept, which is sometimes call the new hermeneutic, but two verses are enough to see that it is wrong. Romans 3:4 -- Let God be true, but every man a liar. 2 Peter 1:20 -- Knowing this first, that no prophecy of the scripture is of any private interpretation. Inspiration is not just something that applies to some topics in the Bible but not to others. This viewpoint might be called partial inerrancy. That is, the Bible is the inerrant word of God with regard to some theological matters, but it is the errant word of God with regard to other matters (which typically include science and history). McGarvey: "Still another theory ... teaches that the sacred writers were guided by the Holy Spirit in all matters essential to the great purposes of revelation, such as matters of doctrine, morals, and faith; but in all other matters they were left to their natural powers, and that therefore they were, in regard to these, as liable to mistakes as other men." Rudolph Bultmann in his book "Myth and Christianity" argues that we must cut away the myths or demythologize the Bible so that we can discover the kernel of truth it contains. It is interesting to me that no one (as far as I know) has ever argued that the Bible is inerrant with regard to science and history, but it is not inerrant with regard to theology. Why is it that the partial inerrancy crowd seems so certain that the Bible remains inerrant with regard to theological matters when they believe it to be error-filled with regard to other matters? If the Biblical record cannot be trusted in areas of fact in which what it says can be verified by man, then how could it ever be trusted in areas where it cannot be tested? Who would believe a prophet would purported to tell you what would happen a thousand years hence and yet could not accurately tell you who was at that very moment ruling as king in a neighboring country? The answer to Jesus&apos; question is that if what he told us in his word about earthly things were not true, then we would have no reason at all to believe what he told us about heavenly things. If the Bible contains errors -- any errors -- then it is not something after which we should pattern our lives and upon which we would stake our eternal destiny. And the Bible does not just contain the word of God -- the Bible IS the word of God. If it contains the word of God and also contains error, then there is no way we can know into which category each verse belongs. Inspiration is not mechanical dictation. The books of the Bible have unique styles and unique vocabularies appropriate for the backgrounds of the authors. Mark for example is written in simple Greek, while Luke and Acts are written in a scholarly style. The Bible is inspired in the sense that each word of the original autograph copies of Scripture was a word that God provided and that was recorded through the use of a human instrument. 2 Timothy 3:16-17 -- All scripture is given by inspiration of God, and is profitable for doctrine, for reproof, for correction, for instruction in righteousness: 17 That the man of God may be perfect, throughly furnished unto all good works. Note from that previous verse that it is the Bible that is inspired or God-breathed rather than the authors of the Bible. We sometimes refer to the inspired authors of Scripture (and there is a sense in which that is correct), but technically it is not the author that is inspired but rather the words written down by that author at the direction of the Holy Spirit. Another interesting point is to compare God&apos;s special revelation with his natural revelation. 2 Timothy 3:16 tells us that the former was God breathed, and Psalm 33:6 tells us that is also true of the latter -- and that the two are tied together. Psalm 33:6 -- By the word of the LORD were the heavens made; and all the host of them by the breath of his mouth. Inspiration requires inerrancy. Absent inerrancy there can be no inspiration. Hebrews 6:18 -- That by two immutable things, in which it was impossible for God to lie, we might have a strong consolation, who have fled for refuge to lay hold upon the hope set before us. Titus 1:2 -- In hope of eternal life, which God, that cannot lie, promised before the world began. John 17:17 -- Sanctify them through thy truth: thy word is truth. Psalm 119:160 -- Thy word is true from the beginning. 1 John 5:6 -- And it is the Spirit that beareth witness, because the Spirit is truth. God cannot breath error, and that is exactly what one is saying when one argues that the word of God contains error. If anyone ever tells you that the Bible contains errors (and particularly if that person at the same time purports to be a Christian), you should remind them of the doctrines that are either based on or explained by those earlier events that they claim are in error. If Adam and Eve never existed, then the fall must never have occurred. And absent the fall, what happens to God’s plan of redemption? Why do we even need such a plan absent the fall? If Adam never existed, then how do we explain Romans 5:14? “Nevertheless death reigned from Adam to Moses, even over them that had not sinned after the similitude of Adam&apos;s transgression, who is the figure of him that was to come.” Or 1 Corinthians 15:45? “And so it is written, The first man Adam was made a living soul; the last Adam was made a quickening spirit.” Or 1 Corinthians 15:22? “For as in Adam all die, even so in Christ shall all be made alive.” If the first Adam never existed, then what about the last Adam? I know it is fashionable today (as in the past) for those who consider themselves “sophisticated thinking people” to disbelieve and discredit the Bible, but in my experience those (and especially those who consider themselves Christians) who are very definitely not thinking are those who believe they can pick and choose what is true and what is false out of the word of God the way someone might pick and choose in a cafeteria line. There are consequences when inerrancy is rejected. If you hack away at the root, you shouldn’t expect the tree to continue standing. The Bible says that it is inspired and inerrant. What else does the Bible say about itself? The Bible says that God&apos;s word is unchanging and eternal. Psalm 119:89 -- For ever, O LORD, thy word is settled in heaven. 1 Peter 1:24-25 -- For all flesh is as grass, and all the glory of man as the flower of grass. The grass withereth, and the flower thereof falleth away: 25 But the word of the Lord endureth for ever. And this is the word which by the gospel is preached unto you. The Bible says that the New Testament is Scripture just as the Old Testament is Scripture. 1 Timothy 5:18 quotes Deuteronomy 25:4 and Luke 10:7 – and calls both Scripture. 2 Peter 3:15-16 refers to Paul’s epistles as Scripture. The Bible connects Jesus with the word of God – He is the word made flesh. John 1:1, 14 -- In the beginning was the Word, and the Word was with God, and the Word was God. ... And the Word was made flesh, and dwelt among us, (and we beheld his glory, the glory as of the only begotten of the Father) full of grace and truth. John 12:48 -- He that rejecteth me, and receiveth not my words, hath one that judgeth him: the word that I have spoken, the same shall judge him in the last day. What does Jesus say about the Bible? Jesus says that the Old Testament events were actual historical events. Of the 1800 verses in the Bible that include direct quotations from Christ, 180 of them (one tenth) come from the Old Testament. Jesus upbraided those who did not know the word of God, and said that was one reason for their errors. Mark 12:24 -- And Jesus answering said unto them, Do ye not therefore err, because ye know not the scriptures, neither the power of God? Think about the items on that list – Adam and Eve, Noah, Jonah. Aren’t those the three most contested people in the Old Testament? Are they the focus of most liberal attacks? Is it a coincidence that those are the three Jesus confirmed to us are actual historical people? Jesus says that the Bible is true. We cannot have a divine Savior and an errant Bible because Jesus said that the word of God was without error. Jesus says that the Bible cannot be broken. John 10:35 -- The scripture cannot be broken. Jesus says that the Bible will never pass away. Matthew 24:35 -- Heaven and earth shall pass away, but my words shall not pass away. Think for a moment about what it would mean if the word of God did ever pass from the earth. John 14:6 -- Jesus saith unto him, I am the way, the truth, and the life: no man cometh unto the Father, but by me. Acts 4:12 -- Neither is there salvation in any other: for there is none other name under heaven given among men, whereby we must be saved. If the word of God were to ever perish from this earth, then the earth might as well end at that time because absent the knowledge found in this book not another person would ever be saved! Henry Ward Beecher: "Sink the Bible to the bottom of the ocean, and still man&apos;s obligations to God would be unchanged. He would have the same path to tread, only his lamp and guide would be gone; the same voyage to make, but his chart and compass would be overboard!" Sadly, the situation is no different if, rather than being tossed overboard, our Bibles are tossed on the shelf and never opened. 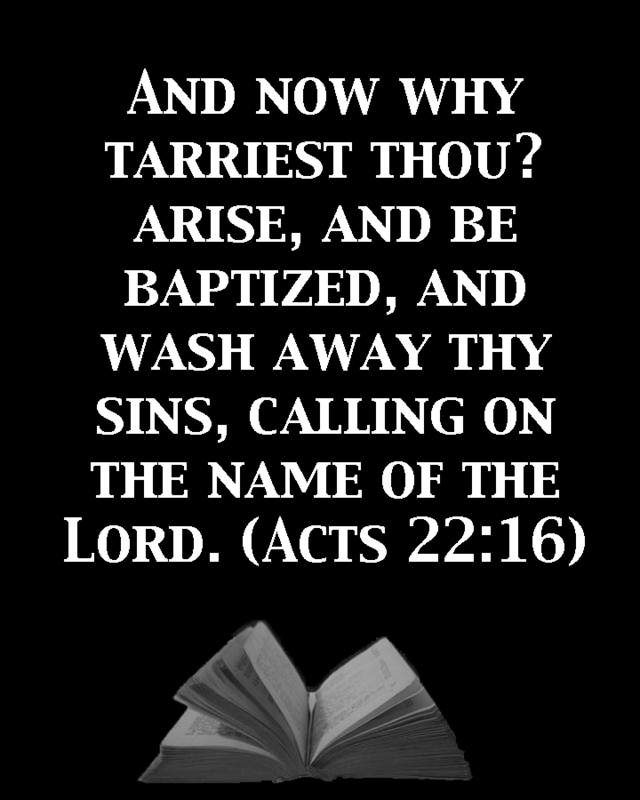 Amos 8:11 -- Behold, the days come, saith the Lord GOD, that I will send a famine in the land, not a famine of bread, nor a thirst for water, but of hearing the words of the LORD. Truth may be scarce, but the supply has always exceeded the demand! Let’s shift gears again and consider another question about the Bible – which version of the Bible should I use? Before we answer that question, let’s say a few things about translations in general. First, a question – is it possible for a translation to accurately convey the word of God from the original languages? Some have argued that we can never really know God’s word for sure in a translation, but the Bible says otherwise. The inspired text of the New Testament contained numerous quotations from the Old Testament, but those quotations largely come from the Septuagint, which is the Greek translation of the Hebrew Old Testament. Also, and although there is some disagreement on this point, most scholars believe that Jesus primarily spoke Aramaic. What that means is that the inspired accounts of his teachings are translations of the Aramaic he spoke into the Greek of the New Testament. That is, the original Greek of the inspired text is itself sometimes a translation. Clearly we can know God’s word in a translation. But is that true of every translation? How can we know, and how should we choose? Translations of the Bible generally follow one of two different approaches. One approach (of which the NIV and the Living Bible are examples) is called dynamic-equivalence or functional-equivalence. The other approach (of which the KJV and the ASV are examples) is called formal-equivalence or formal-correspondence. The chief concern of the dynamic-equivalence approach is readability. This approach attempts to convey the thought of the original languages to the reader with the greatest possible clarity while giving little or no attention to obtaining a word-for-word correspondence between the original and the translation. It focuses on obtaining a correspondence of ideas between the two languages. Its goal is to produce an effect on the reader in the receptor language equivalent to what was produced on the original recipients of the message in the source language. A formal-equivalence translation concerns itself primarily with accuracy or faithfulness to the original text. It seeks as close a match as possible between the elements of the receptor language and those of the source language. To accomplish this goal, the literal translation preserves as much of the source-language grammatical structures and word usages as the boundaries of proper English will allow. Is one approach better than the other? If so, which approach should we choose? For those who believe in verbal inspiration, the word for word formal-equivalence approach is the only approach that should be used. (The handout highlights in yellow the translations that I recommend – the ASV, the KJV, the NKJV, and the ESV). God did not just convey ideas; God conveyed words. If we want to possess the Word of God in our language, we need to make sure we possess the words of God in our language. But what about the dynamic equivalence approach? It is certainly a lot more popular today than the formal approach. Why not just join the crowd and use one of those versions? Let’s listen to those who support the dynamic approach. How do they explain it? The Good News Bible states that its intention is to convey “the meaning of the original” rather than the words of the original. The NIV states that its intention is to convey the “thoughts of the Biblical writers” rather than their words. Really? Let’s examine that claim. As an example, consider 1 Thessalonians 1:3. In the KJV we read, “your work of faith, and labour of love, and patience of hope in our Lord Jesus Christ.” You will find almost identical renderings in the ASV and the ESV. Why? Because those translations are based on the primacy of words. Fidelity to the words of the original keeps the translators from straying from the path that the original text itself sets out. What happens when that curb is lifted? What happens when the translators are no longer concerned with maintaining fidelity to the words of the original text? “…how you put your faith into practice, how your love made you work so hard, and how your hope in our Lord Jesus Christ is firm” (GNB). “…your faithful work, your loving deeds, and your continual anticipation of the return of our Lord Jesus Christ” (NLT). “…your faith and loving work and…your firm hope in our Lord Jesus Christ” (CEV). Two things are clear from those examples. First, it is difficult to correlate these renditions with the essentially literal versions we quoted earlier. Instead, what we see are major deviations from the literal rendering of the original. In fact, if we did not know that these were all translations of the same passage, that fact might easily escape our notice. Second, the sheer range of variability in the dynamic equivalent translations of this verse shows that once fidelity to the language of the original is abandoned, there are no firm controls on interpretation. The result is a destabilized text. Faced with the range of dynamic equivalent translations, how can a reader have confidence in an English translation of this verse? Once translators adopt the principle that only the thought of the original needs to be communicated, with the words of the original being dispensable, linguistic license sets in because there is nothing to control the actual words that are chosen to communicate what a translation committee regards as the meaning of the text. And if these thought for thought translations are supposed to be so accurate (more so, we are told, than word for word translations) – why are all they all so different? How can such wildly different renditions of the same verse all be accurate? The answer is that none of them is accurate. Accuracy was not their goal, despite what they may say. Sometimes you hear the objection that all translation is interpretation – but that statement is misleading. There is a crucial difference between linguistic interpretation (decisions regarding what English words best express Hebrew or Greek words) and thematic interpretation of the meaning of a text. Linguistic interpretation determines whether a translation speaks of the wicked as “scoffers” or as “mockers.” An entirely different level of interpretation occurs when a translation drops the metaphor of the godly person’s not “standing in the way of sinners” and replaces it with the statement that godly people “won’t follow sinners” (CEV). And how is that verse treated by the dynamic approach? “This Good News tells us how God makes us right in his sight” (NLT). “For the gospel reveals how God puts people right with himself” (GNB). “The good news tells how God accepts everyone who has faith” (CEV). By the time we get to that last example, we have wandered so far from the literal meaning of the original text that we need to restate it: “For therein is the righteousness of God revealed from faith to faith.” That is translation; the other renditions are interpretations. There is a crucial difference. And writing a commentary and calling it a translation does not make it a translation. The primary problem with modern translations of the Bible is that most of them are not translations of the Bible. They are instead commentaries on the Bible in which the ideas of men have been inserted throughout the text, replacing the words of God. (Deut. 4:2) Ye shall not add unto the word which I command you, neither shall ye diminish ought from it, that ye may keep the commandments of the LORD your God which I command you. (Prov. 30:5-6) Every word of God is pure: he is a shield unto them that put their trust in him. 6 Add thou not unto his words, lest he reprove thee, and thou be found a liar. If a translation violates these commands, what good is it? The root of the problem is that most modern translations have misunderstood the translator’s task. The translator is a messenger who bears someone else’s message. He is a steward of the work of another whose function is to be faithful to what is before him and not to change the text. He is not an editor or a commentator. The basic problem with most modern translations is that they are attempting to do the impossible – they are trying to improve the original text! God’s word cannot be improved! We see that attempt at improvement in the so-called gender neutral versions of the Bible today. One of these PC Bibles, The New Testament and Psalms: An Inclusive Version, published by Oxford Press in 1995 even finds fault with references to God’s ‘right’ hand as a place of privilege. Why? Because it could offend people who are left-handed! But, we are told, these modern versions are so much more readable than the literal word for word translations. What good is readability if a translation does not accurately render what the Bible actually says? If a translation gains readability by departing from the original, readability is harmful. Here is an extremely readable selection from The Message: “You’re blessed when you’re at the end of your rope. With less of you there is more of God and his rule. You’re blessed when you feel you’ve lost what is most dear to you. Only then can you be embraced by the One most dear to you.” You may not even recognize those verses, but they are beatitudes from Matthew 5:3–4. The problem is that this readable passage is so far removed from what the original says as to render the original nearly invisible. What if we did to English texts what these modern translations do the Greek and Hebrew texts? How much of the original has been lost in that rewrite! And, we are told, these modern versions are so helpful because the iron out ambiguities in the original text. That is likely not how we would have expressed that thought, but that is how that father said it. Mark did not interpret it for us; he simply recorded what the father said. What does it mean? Help me overcome my unbelief? Forgive me for my unbelief? Help me overcome the consequences of my unbelief? There is some ambiguity in the original text. The goal of a translation is not to remove that ambiguity but is rather to retain it! (NIV) I ‌do‌ believe; help ‌me overcome‌ my unbelief! (TLB) I do have faith; oh, help me to have more! Those are not translations! They are interpretations. There is a huge difference. A big problem with modern translations is that they foreclose interpretative options for the reader – often in favor of interpretations that are wrong. But rather they choose correctly or incorrectly, it is not their job to choose! If there is ambiguity in the original text, then a good translation should carry that same ambiguity over into the translation. Let’s assume I gave you a note that read “Meet at 5,” and I asked you to pass that message along to someone who spoke only Spanish. How would you translate my note? Would you assume I must mean “Meet me at 5,” or “Meet me at 5 PM,” or “Meet me at 5 PM today,” or “Meet me at 5 PM today here at the church building”? My message was ambiguous, but a proper translation of it should have carried that ambiguity over into Spanish. We act as if the reading the Bible should make no demand on the reader. The goal, we are told, is that the Bible should be “easily understood by the readers” (GNB preface) and “immediately understood by the contemporary reader” (NLT preface). That was not even always true of the original text! Why should it be the goal of the translated text? Remember that many New Testament books were written primarily for a Gentile audience who had little or no prior understanding of the history and culture of Israel. The events of Abraham’s life (around 2000 B.C.) were as far in the past for them as the events of the New Testament are for us! Don’t you think they had some problems understanding some of Paul’s arguments? Was that Paul’s fault or God’s fault? Not at all. The text simply placed some demands on the reader – and the same thing happens today with countless other texts. Why should the Bible be any different? A good translation should not attempt to make the Bible simpler than it was for the original audience. We should reject the popular notion that the Bible needs to be dumbed down for the modern reader! Although it is not universally true, underlying many of these modern translations is a disbelief in the inspiration and inerrancy of Scripture. To see that, all you need to do is read their prefaces. Moffatt declares that he, along with others, has been ‘freed from the influence of the theory of verbal inspiration.’ (James Moffatt, The New Testament, A New Translation, 1913, vii). Phillips, in the introduction to one of his paraphrases, wrote, ‘… Most people, however great their reverence for the New Testament may be, do not hold a word-by-word theory of inspiration …’ (J. B. Phillips, The Gospels Translated into Modern English, 1952, v). Do false views about inspiration affect translations made by those who hold those false views? We just saw what Phillips had to say about inspiration – let’s look at how he translates 1 Corinthians 14:22. Yes, Phillips completely reverses the statement by Paul. It reminds one of Satan’s complete reversal in Genesis 3:4 (“Ye shall not surely die.”). How does Phillips explain himself? With a footnote that suggests the possibility of “a slip of the pen on the part of Paul.” Aren’t we glad that Phillips came along 2000 years to correct the Apostle Paul! I mentioned earlier the phrase “destabilized text.” This is perhaps the greatest danger when it comes to these modern translations. They leave people with the false impression that if they don’t like what a particular verse says, then they can just shop around until they find a version of it more to their liking. In short, these modern versions, with their wide variation in rendering the text, destabilize the text in the minds of many people. The unchanging word of God becomes something that changes each time they pick up a new version. That false view of Scripture breeds false views on other matters. One other thing to be careful about is that some translations are dishonest – and that is the only word for it. And yet a few verses later in John 9:5 we read: “I am the light of the world.” The verb there is the same as in John 8:58, so wouldn’t we expect the Jehovah’s Witnesses to translate it the same? (“I have been the light of the world.”) And yet they do not. Why? Because they don’t need to twist John 9:5 to match their false view of Christ as they do for John 8:58. Another extreme example is the Williams translation of the New Testament. It purports to be extremely careful in translating verb tenses, but listen to how it translates Acts 2:38. Reading Williams translation one might arrive at the false conclusion that repentance alone is enough for salvation. But, of course, Williams’ translation includes extra words and long dashes that are not in the Greek text. And speaking of footnotes, let’s look at Matthew 24:34 in two very popular modern translations. The KJV reads, “Verily I say unto you, This generation shall not pass, till all these things be fulfilled.” Clearly, whatever Jesus had just said was about to happen – and it did happen in AD 70 when Jerusalem was destroyed by the Romans. The problem for some, though, is that they misread the first part of Matthew 24 to apply, not to the end of Jerusalem, but to the end of the world. That means that when they get to verse 34 something has to give – either their false view of the preceding verses or the text of verse 34. If Jesus was saying that the Jewish race would not pass away until all of those things were fulfilled, then maybe they all do apply to the end of the world. But was that what Jesus said? No. And they know it. The footnote is dishonest. That’s the same word we find in Matthew 24:34. Where is the footnote in Matthew 1:17? Why not a suggestion there that verse 17 could be saying that there were 14 races from Abraham to David? Here is a tip for those translators, as well as for ourselves: We need to change our beliefs to match what the Bible says, and not change the Bible to match our beliefs! (Psalm 1:1-2) Blessed is the man that walketh not in the counsel of the ungodly, nor standeth in the way of sinners, nor sitteth in the seat of the scornful. 2 But his delight is in the law of the LORD; and in his law doth he meditate day and night. We have that same choice here today -- will we sit in the seat of the scornful, or will we be among those who take their delight in the law of the Lord? Word of God or Word of Man?